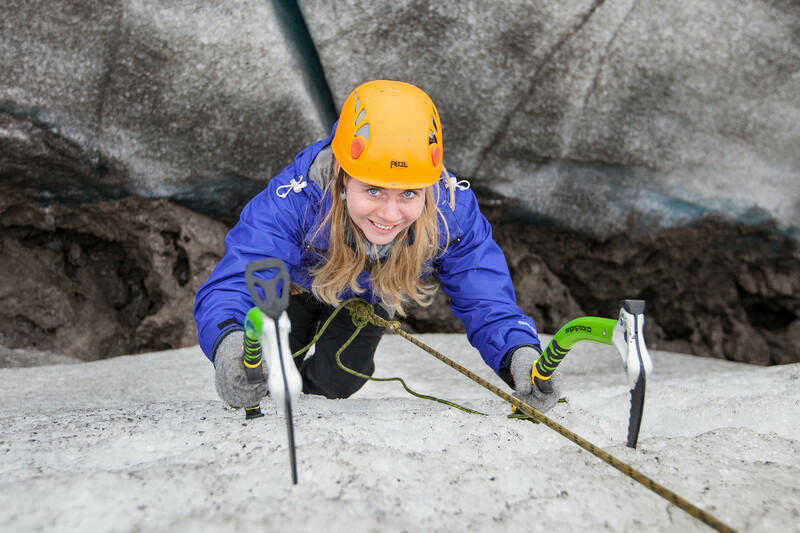 Ice climb on a stunning outlet glacier in Vatnajökull National Park and enjoy the spectacular scenery in Skaftafell. Please note: This is a fixed priced private group tour for up to 4 passengers. Please feel free to contact our sales office if you have request for group larger than 4 passengers. Glaciers, with their many ridges, deep crevasses, various shapes and heights of ice walls makes it an ideal playground for ice climbing. Whether you are a complete beginner looking for an adventure or an experienced ice climber wanting to improve your technique, the glacier has everything you are looking for. After being fitted with the required ice climbing equipment that we provide, your highly trained guide will give you a safety briefing. While walking to the wall to that you will climb that day, you will witness the splendid features of an icy landscape. With only 4 passengers per guide, we are able to adjust the difficulty level to each person for a fun, safe and adventurous experience. This is a great tour with spectacular sceneries viewed from a different angle. Don’t forget your camera, you will want to share this experience with your friends and family! *Due to safety reasons, we are currently not operating glacier tours on Svínafellsjökull glacier. Other beautiful glacier outlets will be explored in the meantime. *The Skaftafell parking lot fee is not included in the tour price. The Guides were very good, very knowledgeable and very friendly. We were provided with all the gear at no extra cost and they made sure that the groups were comfortable & safe during the hike. My wife and 11 year old daughter did the glacier hike and they loved every minute of it and spoke very highly of the knowledge passed on and the attention they paid. I did the Iceclimbing and enjoyed it fully. Most importantly they (the guides) are very concerned of our safety and the natural damage that i done to the glacier. What is the address of the meeting place? Why do I need to arrive 20 minutes before departure time? I have never ice climbed before, will I be able to do it?